Wing span: 3/4 - 1 3/16 inches (1.9 - 3 cm). Identification: Fringes are checkered black and white. 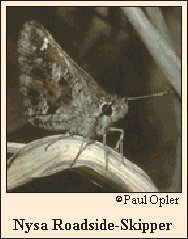 Upperside is black with 3-5 small white spots on the forewing tip. Underside of hindwing is patterned with patches of brown, gray, and black. Life history: Adults fly very close to the ground and often rest on bare spots. Males perch at the bottom of gulches to await receptive females. Females lay eggs randomly on the host plants, usually in the late afternoon. Caterpillars eat leaves and make shelters of rolled and tied leaves, then pupate in a silk-lined leaf case in litter at the base of a grass clump. Flight: Three broods from March-October; several broods throughout the year in South Texas. Caterpillar hosts: Various grasses including St. Augustine grass (Stenotaphrum secundatum), crab grass (Digitaria sanguinalis), bristlegrass (Setaria glauca), barnyard grass (Echinochloa pungens), and green spangletop (Leptochloa dubia). Adult food: Nectar from low-growing flowers including blue spiraea, marigold, lima bean, and cantaloupe. Habitat: Open areas including dry rocky ravines, woodland edges, desert grasslands, yards, and gardens. Range: Southeastern Nebraska, Kansas, and western Missouri; south through Oklahoma and Texas to northern Mexico; west to southeast Colorado, southern New Mexico, and southern Arizona.